At this point in time, there are two formulations of the Butterfly Theorem that have the distinction of having been thought at different times as the first mention of the theorem (but not of the Butterfly designation). An earlier formulation has been discovered recently, that predates the two and, perhaps surprisingly, is due to William Wallace himself. 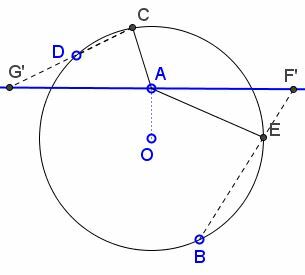 If from any two points $B,E,$ in the circumference of a circle given in magnitude and position two right lines $BCA,EDA,$ be drawn cutting the circle in $C$ and $D,$ and meeting in $A;$ and from the point of intersection $A$ to the centre of the circle $AO$ be drawn, and the points $E,C;\;B,D$ joined, and produced to meet an indefinite perpendicular erected at $A$ on $AO;$ then will $FA$ be always equal $AF.$ Required the demonstration? Let $AB$ be any chord in a circle, through $I$ the middle point of which let two other chords be drawn, the former MIN, meeting the circle in $M,N,$ the latter $OIL,$ meeting the circle in $O,L;$ join the points $L,M,$ and $N,O,$ by right lines which cut the chord $AB$ in $P$ and $Q$ respectively; then is $AP=BQ.$ Required a demonstration. 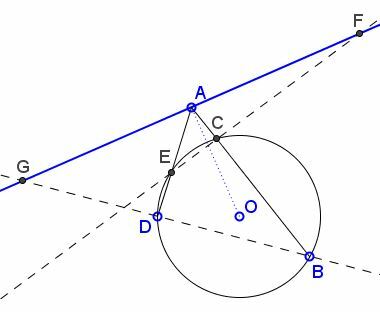 However, with point $A$ located within circle $(O),$ the relation between the three formulations becomes more transparent. How do we observe the diminishing order of generality? 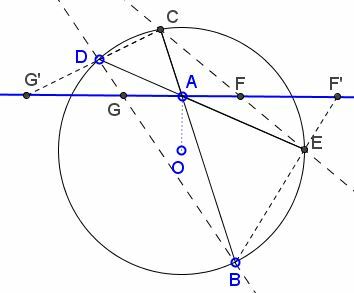 It is known that the line through the center of a circle is perpendicular to a chord if and only if it passes through the chord's midpoint. 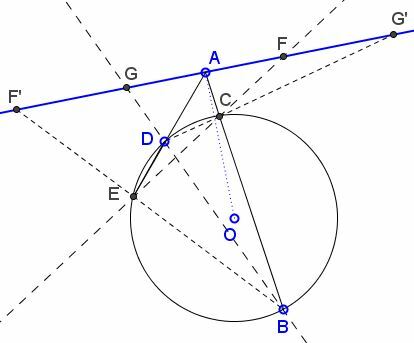 $W$ deals with a line perpendicular to another line through the center of the circle. $H$ takes the former to be a chord with named end points, although the latter play no visible role in the formulation. $S$ emphasizes the midpoint of a chord and, in addition, assigns specific role to its endpoints. 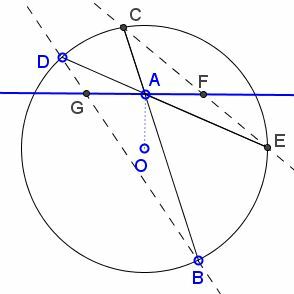 When the perpendicular to the line through the center of the circle does not cross the circle, the distinction between the two cases becomes meaningless, and this squarely places $W$ at the top of the order of generality. It is worth noting that all the proofs (algebraic, in particular) that do not directly appeal to the "butterfly" configuration of the traditional Butterfly theorem (e.g., ## 5, 9, 10) also do not distinguish between the two cases. All such proofs work for the general $W,$ the Wallace original formulation. Three solutions to Wallace's question have been published in the 1804 issue of The Gentlemen's Mathematical Companion. In conclusion, there may have been a reason why Hershel turned to Wallace with a problem related to the one Wallace posted earlier. No links have been yet discovered to the Scurr's posting.